Why are we not, every day, pointing to the real nature of Putin’s project in Ukraine? He sends in his special forces, well equipped and well supplied. The Ukrainian government in Kiev goes around to its allies in the west, to ask whether they might be able to help Kiev get rid of the Russian special forces. Ukraine’s allies decline. Kiev correctly concludes, “We’re on our own,” and decides to retake the buildings, checkpoints, and other territory under Russian control. The fighting gets bad, and casualties run high. Now Putin comes out of his little viper’s nest, and says that Ukraine has to stop killing his special forces! He makes threats about what he will do if Ukrainian armed forces don’t give Russian special forces a free hand in eastern Ukraine. In fact, he threatens to send in his regular military to defend Russian nationals, who he claims are under attack by Nazi fascists and other terrorists. Don’t that beat all? When Prince Charles in the United Kingdom points out, in private, that Putin is using exactly the technique that Hitler used to take over Czechoslovakia and other huge pieces of eastern Europe, the mainstream press climbs all over him. You’re comparing Putin to Hitler? Good God! When Putin makes his threats, the press gives them lots of publicity, without saying anything about the game he’s playing. You send your specialists in to stir up a lot of trouble, then you move your heavy equipment in when the target country tries to resist the backdoor invasion. If you’re lucky, the target country’s friends politely decline to offer any help, which is exactly what happened with Czechoslovakia. Vladimir Putin, no more than Adolf Hitler, wants to fight for something if he can get it for free. Why are we in the west so reluctant to point out what Putin is actually doing? Prince Charles’ private remark should have been publicized by Cameron, Obama, Hollande, Merkel, and every other leader on both sides of the Atlantic. Prince Charles broke the ice, and pointed out the truth. Instead, the press went nuts for a few days, essentially saying, “How could you?” You can always make someone shut up with a public reprimand, right? The mystifying part of the west’s reaction here is, what possible interest does it serve to overlook the nature of Putin’s strategy and tactics? He has already taken Crimea. Do we want him to bite off big pieces of eastern Ukraine as well? Don’t we want to give Poroshenko and his colleagues even a little moral support? Ukrainian troops are fighting hard. Don’t we see that a little encouragement from us would help? Telling the truth gives a huge boost to the young Ukrainian soldiers who have to face down large Russians who wear black masks, black gloves, and fatigues. The weapons those special forces carry are not concealed. We say we’ll impose tougher sanctions on Russia if they don’t stop their campaign in Ukraine. We’ve seen how effective those are. If we don’t want to send any military supplies to Kiev, at least we could give voice to the truth. Let’s say, out loud, that Putin’s playbook for aggression in multi-ethnic European territories did not originate in Moscow. It originated in Berlin, during the 1930s. 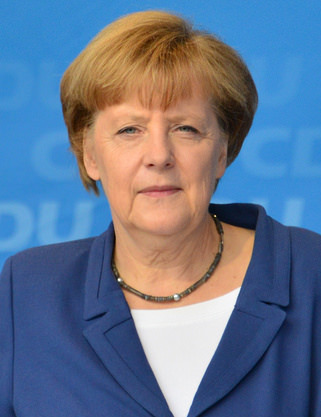 Angela Merkel could be a heroine here, if she publicly charges Putin with subversion. She grew up in East Germany, during the 1950s and 1960s. She knows what it’s like to live in a divided country. If she takes a stand against Putin, we need to let her know she won’t stand alone.